Are you gluten-free or dairy-free? If so, you might not have to be. Eat Wheat is a scientific and clinically-proven approach to addressing food intolerances. After 3.4 million years of eating wheat and only 500,000 years of hunting meat, humans are actually genetically better equipped to eat wheat than meat. This book is your guide to safely bringing wheat and dairy back into your diet. Dr. John Douillard, a former NBA nutrition expert and creator of LifeSpa.com, and author of 6 health books, addresses the underlying cause of the gluten-free epidemic. Eat Wheat explains how a breakdown in digestion has damaged the intestinal wall and leaked undigested foods and environmental toxins into the body’s lymphatic system, causing “grain brain” symptoms and food allergies. Although eliminating wheat and dairy from your diet may help your symptoms, it is a a temporary solution. Eat Wheat addresses the root cause: the inability to digest well and break down harmful pollutants and toxins that can lead to more serious health concerns. I've been reading books on Health & Nutrition for nearly 30 years but few of them so comprehensively explain the way the digestive system works. And Dr. Douillard explains everything in terms that I can understand. He offers lots of examples from patients he's helped over the years too. I've been gluten-intolerant and, thusly, gluten-free for more than 7 years. After reading his book I realized that it is/was possible that it may've been the combination of wheat AND cooked oils, preservatives, sugar, and/or genetically modified corn, etc. that was actually the problem. 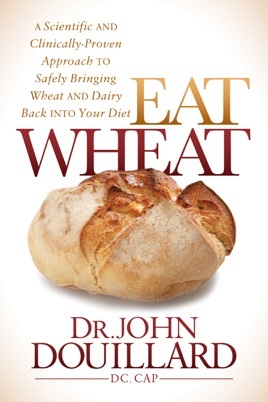 Since reading his book I've been experimenting with eating wheat in small amounts (like ONE piece of bread with a salad or soup) but I'm choosing wheat that is limited to 3-5 ingredients such as: wheat, water, salt and yeast. Turns out, wheat is not the issue after all! I've been pain free, with no bloating, and my digestion is running like a well-oiled machine! Thank you, Dr. Douillard, for doing all of the hard work. For the years of comprehensive research and your hands-on care and consultations with so many patients over the years. And then for pooling this conglomerate of information into a comprehensive body of work that will surely change many lives for the better! I was given an advanced copy of this book to write an honest review for Netgalley. This books explains why so many people are having issues digesting wheat today. The beginning chapters explain how our food has changed and the effects these changes have on our body. Then, the author gives suggestions on natural ways to improve the stomach and the overall health of the body. None of the suggestions are outrageous and seem easy to incorporate into any lifestyle. I found this book informative and easy to read and I plan on trying the suggestions and see if they help. I would suggest this for anyone with stomach and digestion issues. Love this book and John Douillards’ philosophy seeking the truth through the pure and natural and his taking ever deeper steps to finding the cause of illnesses. Love the knowledge he shares like no one else shares which insures his success, even better, a retun of love. What you get here is the truth as he has passionaltely sought it. Why is it that the simple is the most profound? I think it is because it is closer to the Creators design. In the respect for that divine magnificence , John Douillard reveals the ecology God meant for us to follow, ancient wisdom and modern science appeals with good reason for the body to be in harmony and function beautifully. I am certain that I need a lymphatic cleans and to heal and reset my gut to end my autoimmune problems. Thank you, Dr. John Douillard for giving me the tools, I am inspired and so very hopeful.